NUST MISIS scientists have proposed a technology that can double the strength of composites obtained by 3-D printing from aluminum powder, and advance the characteristics of these products to the quality of titanium alloys: titanium's strength is about six times higher than that of aluminum, but the density of titanium is 1.7 times higher. The developed modifiers for 3-D printing can be used in products for the aerospace industry. Two decades ago, molding was considered the only cost-effective way to manufacture bulk products. Today, 3-D printers for metal are a worthy competitor to metallurgical methods. 3-D printers have a chance to replace traditional methods of metallurgical production in the future. Using additive technologies with 3-D printing creates a whole array of advantages, from creating more difficult forms and designs to the technology's cheaper cost and theoretical edge. Today, there are several technologies that are used for printing metal, the main ones being Selective Laser Melting (SLM) and Selective Laser Sintering (SLS). Both of them involve the gradual layering of metal powder "ink," layer by layer, to build a given volume figure. SLS or SLM are additive manufacturing technologies based on layer-by-layer sintering of powder materials using a powerful (up to 500 Watt) laser beam. Titanium is the optimal metal for manufacturing products for the aerospace industry, however it cannot be used in 3-D printing because of the fire and explosion hazards of powders. Aluminum is an alternative, as it is lightweight (density 2700 kg/m3) and moldable, having an elasticity modulus of ~70 MPa. This is one of the main requirements of the industry for a metal to be suitable for 3-D printing; however aluminum alone is not strong or solid enough: the tensile strength even for the alloy Duralumin is 500 MPa, and its Brinell hardness HB sits at 20 kgf/mm2. 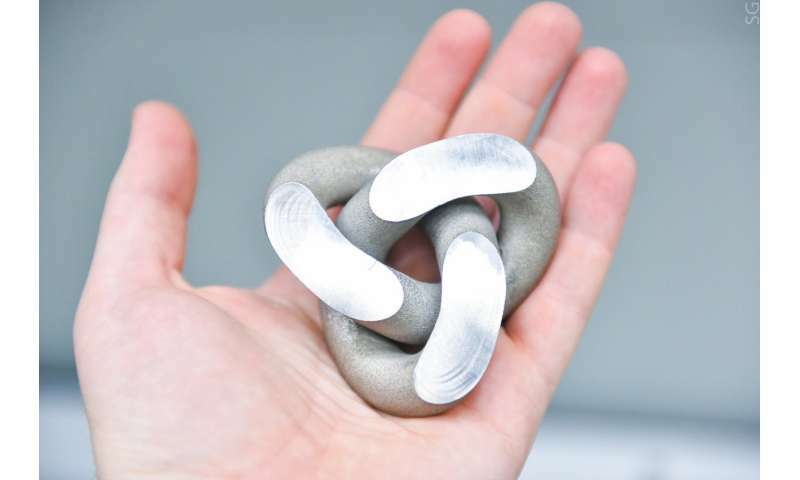 The solution on how to strengthen aluminum 3-D printing was proposed by the research team led by Professor Alexander Gromov from the NUST MISIS Department for Non-Ferrous Metals and Gold. "We have developed a technology to strengthen the aluminum-matrix composites obtained by 3-D printing, and we have obtained innovative precursor-modifiers by burning aluminum powders. Combustion products—nitrides and aluminum oxides—are specifically prepared for sintering branched surfaces with transition nanolayers formed between the particles. It is the special properties and structure of the surface that allows the particles to be firmly attached to the aluminum matrix and, as a result, [doubles] the strength of the obtained composites," said Alexander Gromov, head of the research group.